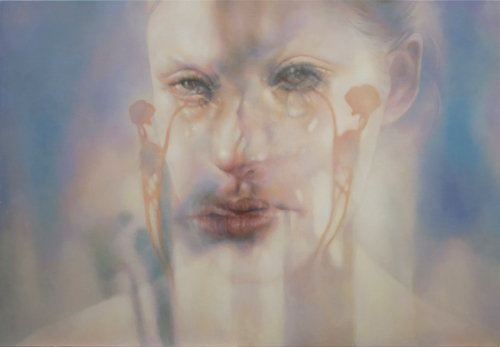 Yoshimi Arts is pleased to present “Have You Seen This FACE?” by Miki Sato. This is the artist’s sixth solo show at the gallery. Miki Sato’s process begins with selecting figures from among videos and photos at random, and making layered drawings of them. Drawing is the foundation of creation, and she engages in that act over and over again, until a certain form begins to appear. She then takes her time elaborating on this image by painting on it with oil paints. Throughout her past solo shows, she has used the “face” which has been a way to introduce this world and the interpretations of its complex energy that is impossible to verbalize, as a way to retain the complexity, and make it visible in all of its complexity. For this exhibition, she takes a paradoxical approach to the thoughts and processes from the past to pursue the possibilities of feeling the energy itself, and making it tangible. She attempts this by minimizing the handling of the “face” and confronting the essence of that image of the face in the work. 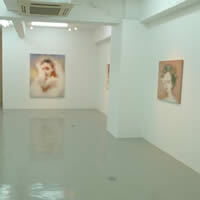 5 galleries at Wakasa Bldg. and Santosu Bldg. will hold a party at the same time. ■artisit will be at the gallery on Feb 2 & 3.